This might seem like a list of school geography terms, but as Zwift is an international game, with Zwift Rides and Races frequently running across multiple time zones, it is vital to look at who you are trying to get to come to an event, and would a better time slot allow for more riders to attend? Currently the various Zwift events and races are organised through Facebook. It is ALWAYS worth while checking the event details as there will be specifics regarding the jersey to be worn to help keep the group together, direction of this race, number of laps/km and the race leader. Scheduled WSR group rides last around an hour, (3 laps or 27.3 km/16.9 mi), but riders often stay longer if time allows. During the scheduled hour, please stay between the leader and the sweeper. More experienced riders are encouraged to hang back when needed to help newer riders back to the group if needed. Meet at the ‘Just Ride’ point, but you can use the option to ‘Join’ any WSR rider you see parked online to keep the starting cluster as closely grouped as we can. We’ll plan on slow-rolling at 8:00 am EDT, making sure that the group is all together before increasing to our normal pace. We’ll see you on the Island! This is a 5 1/2 lap training race following a 1/2 lap neutral warm-up. Roll out from the Start marker at 6:00pm EDT (22:00 UTC) exactly. If a turn is required start in the normal direction then U-turn just past the start/finish banner. Please try to ride behind race leader (Normally – C. Wiedmann TNW) for the neutral portion. Group messages will indicate the start, either at the Statues (Clock wise) or at the bridge before Hank’s gas station (Counter clockwise). The finish of the race is at start/finish after 6 laps (including warmup). An earlier time slot of the ZTR race. I will wear the ZWIFT “Z” jersey for the neutral portion. Please remain behind race leader for the warm up, aiming for <2watts/kg to allow for catch ups and connection issues before the start. If you wish to categorise yourself in your names please do so, but PLEASE add TNW after your last name to identify you’re participating (for instance, I would set my last name to “J GILL ZTR EB” to indicate I’m going to in the B group). Easy paced ride 18-19 minute laps. Add ZUK to your name and wear the yellow/black ‘killer bees’ jersey. We target four laps but late risers welcome to join in or if you have only time for a couple then that is also great. 4 1/2 lap training race (45km) following a 1/2 lap neutral warm-up. Roll out from the “just ride” point at 17:30 UTC (10:30 am PDT, 18:30 BST, 19:30 CEST) exactly. This is one where it’s important to check what that plan is, as a training ride, the plans can vary. Start at a slow pace (between 1.0-1.5w/kg). Stronger riders are encouraged to reverse/drop back to assist in sweeping the back. After a Sprint or Kom participants MUST soft pedal (1.0 w/kg or less) until the main group catches you up and fall in behind R.Bolt Don’t forget the jokes and banter! BASIC JERSEY 1 – BEES! 1. Communication is key to the success of the ride; to that end we need constant updates on the state of the peloton. 2. Stronger riders are encouraged to reverse/drop back to assist in sweeping the back. 3. If a rear rider needs help then let us know. 4. If you need a lead out on the sprint, ASK and then come back to the group during the first 3 laps. 5. Assist on the KOM’s. 6. The first 3 laps is not about the individual, it’s about everyone working as one body of riders, similar to the weekend WSR rides. This one is all about the big numbers – 8 or 16 laps! Meeting point: UCI Start/Finish banner. *No U-Turn on Richmond. So remember to restart your Zwift session a few minutes prior to 8pm, or time a warm-up lap to perfection to be at the start for the roll-out. Ride Style: Bunch roll for first 2.5 laps (steady – 3-3.5 w/kg. on the climbs, and 2-2.5 w/kg on the flats). Then the gloves come off at the base of the Libby Hill cobbled climb until the finish 3KM away. 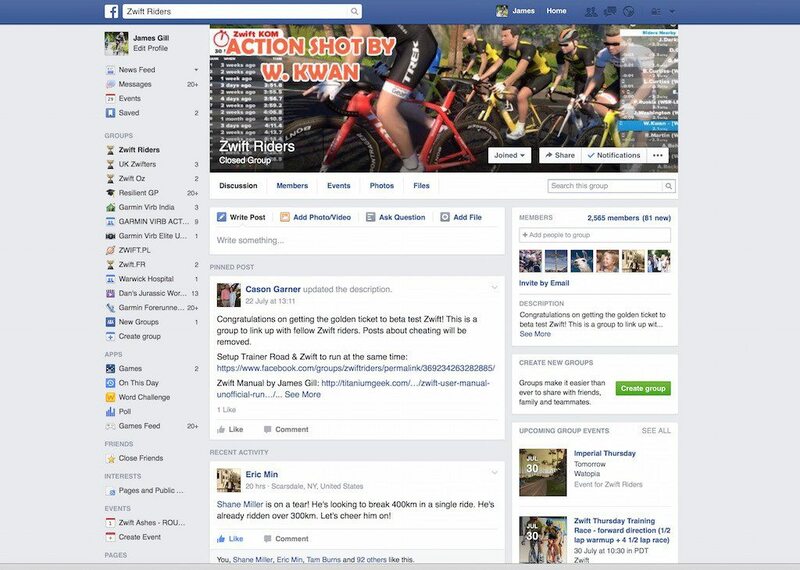 There is no “one way” to organise a Zwift event currently through FaceBook, due to the limitations of FB. You can create an event within a group – e.g. 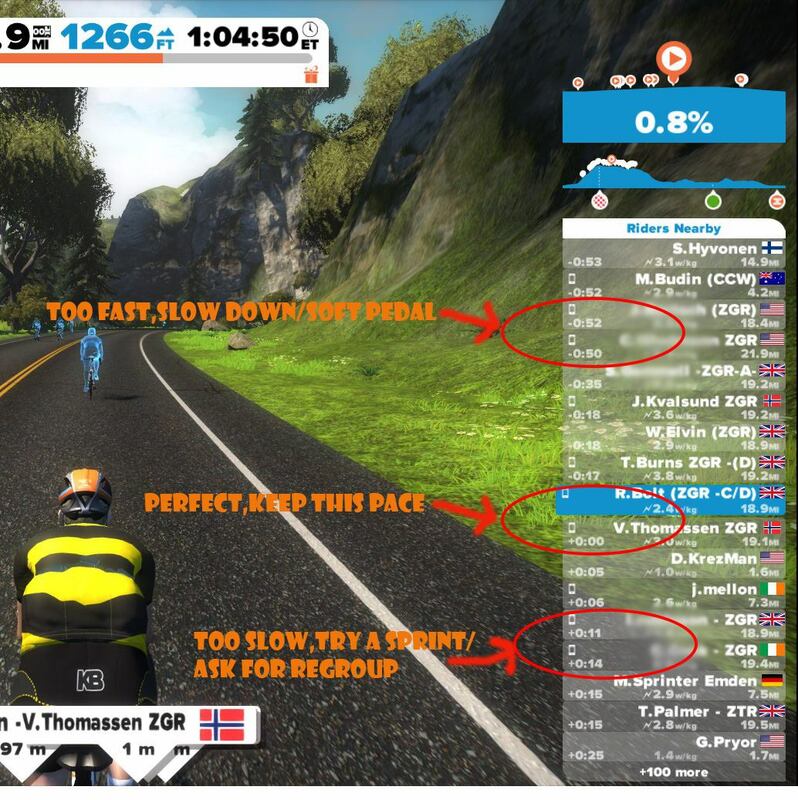 Zwift Riders, but then can’t share that ride easily with other groups, e.g. Zwift UK riders. The benefit of doing it within the group means that it goes on the groups event page, which means that people who dont see you initial post can still find it easily. The other issue here then, is it means you need to copy the post into each group you want to see it, as a separate event. Which means the Riders Group can’t see what the UK group are saying unless you are in both groups, looking at separate events – which is just complicated. The other option is to create the event on your own Facebook page – but make sure it is set to public at the very initial stage, vitally important and can’t be changed after. By creating the event, as your own personal one, you can share the event to groups, everyone can see the same event, everyone talks on the same event BUT it does get added to the groups event page, so can get missed. As you can see there is no one size fits all! Zwift in the future will hopefully produce their own way of running events which will be much clearer. State which jersey you want people to wear – makes keeping the group together, and seeing riders you are competing with easier. Oh and choose a cool event photo! w/kg – Watts per Kilogram body weight – a measure of power output more suited to predicting cycling performance (especially on hills).